you can't see it but Abby taped a sling onto her Poppa doll that goes in her dollhouse so they match! --so cute! Last Monday Poppa had surgery on his shoulder. He has been recovering really well but the kids have been very worried about him! The day after the surgery we went over to check on him and he was very drugged up:) -the kids were happy to see that he was alive and was in good spirits though. We went over a few days later and Abby brought along her Poppa doll from her dollhouse. She had taken construction paper and made a sling, water cooler (cooing pad for the swelling and pain) and a black squishy ball that she placed in his other hand which he used to build up strength in his bad arm. These were all the things he was using from the surgery and she was very excited to bring the doll over to show him! 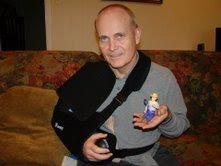 He thought it was very cute and thoughtful--he even took a picture with the doll! ~this made Abby very happy. It has been a week and 2 days since the surgery and he is still recovery nicely-he even went to church Sunday--crazy I know! We're a resilient bunch we Stamps!! :) ...crazy but resilient!